Indie game of the year? Dan was editor of Gameplanet NZ between 2008 to 2012. He now lives in snowy Toronto, Canada. Horizontal and vertical synch adjustments may be largely relegated to the past, but the developers of Hotline Miami clearly haven't gotten the memo. Stuck as they are in a top-down late-'80s world where bold, gaudy visuals, electropop music and neon backgrounds all but guaranteed a classic video game, Hotline's initial appearance mimics that of a loose VGA cable. The screen flickers and bounces in the manner of an old CRT discarded when it started whistling and the cat wouldn't sit on it any more. Large, chunky figures adorn the C64-throwback, each with the depth of a Gauntlet character and all the visual sophistication of a Sierra adventure. It's brash, irritating and ultimately may induce seizures. It's a one-man Cannon Fodder clone running on teletext and adrenaline. In short, it's utterly brilliant. Fortunately, there's no real attempt at a meaningful story, because any attempt to introduce clever writing would only detract from the main premise; to kill everything in sight, including the player's short-distance vision. The hotline in question rings, a generally unknown character instructs the mute protagonist to De-Lorean it to a new location in Miami where a large collection of evil gangsters roam strategically around a building waiting for instant death. Perhaps a damsel in distress needs to be rescued, or another character is introduced to spin the story towards an ever-more morbid conclusion, but to be honest it's hard to notice or care. The game proper only begins when attempting to enter the building and take out the gangsters, and each safe area before the building is breached forms the checkpoint for that floor. New levels are reached by clearing each floor, along with new weapon unlocks when each complete level is cleared. Key to the entire equation is an almost suicidal level of boldness, mixed with the kind of fly-like reflexes required to chain together almost impossible hand-to-hand, knife and weapon combinations. Upon absolutely inevitable death, a respawn encourages serious meditation as to how a particular enemy managed to get the jump for the twentieth time. Was it that the henchman walking along the corridor should have been knifed first, then finished on the ground whilst picking up a baseball bat and taking out the guard entering from the other room? Or would it be better to simply unload a machine gun into the room and shoot whichever guards come running? For the few hours of insanity Hotline provides, these questions form the bulk of the analysis each player will entertain over and over again at each respawn. Repetitive? Absolutely, but it's a mad repetition driven by a thirst for perfection, and inspired by the truly awesome feeling when each level is cleared after a series of moves that would make a stabbed rat look lethargic. Many attempts start with a door breach that clobbers a roaming enemy, sending him spinning to the ground stunned. From there, it's possible to stab another enemy in a whirlwind sprint around the room, whilst picking up a gun to deal to whoever might be in a position to issue ranged fire in return. At the end of each level, a series of scores are tallied up on a barely readable board, where bonuses are rewarded for combo kills, the time taken to clear the level and a host of other unfathomable skill rewards. A grade is awarded, which typically starts high and slides the further the game progresses, a case of art mimicking life for anyone who had a video game addiction in high school. Real flaws do exist however. The save game system isn't intuitive, and on occasion the game can bug out entirely requiring levels to be repeated. Boss fights aren't always well thought out, and are linear in nature, requiring typically one way to succeed; this feels shallow compared to the wide range of possibilities introduced in vanilla combat. Indeed, separated out, the game consists of many poor or substandard aspects. The enemy AI alternates between totally stupid and insanely difficult - seemingly at random. The control system is unforgiving and takes a disproportionally long time to master. The graphics – as mentioned previously – are universally awful, and the Drive-inspired music is likely to cause a nosebleed if consumed in conjunction with caffeine. But when these poorly coded segments are joined together, some kind of magic occurs elevating Hotline far beyond the sum of its parts. Aspects that would otherwise utterly break any other game become fused with the gameplay itself, redefining at once what it means to play an entertaining game. Not only is Hotline a shoe-in for Indie of the Year, it represents a masterful, artistic achievement that generates equal parts frustration, enjoyment and addiction, and therefore comes highly recommended. 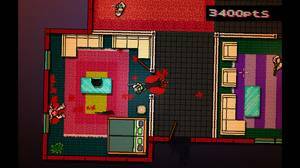 In the sparsely populated kingdom of 2D top-down action titles, Hotline Miami reigns supreme. Ups It's a collection of broken, cheap gaming tropes underlined with utterly bonkers combat all twisted together to create an awesome little indie title. Downs Linear Boss fights aren't quite as enjoyable as they could be. PS3 and Vita versions of Hotline Miami coming to NZ "soon"
Wasn't submitted for local classification. Wants to fund larger games, however. 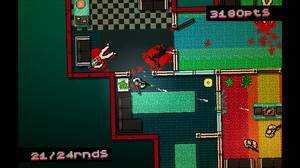 ▰ 10 PS3 and Vita versions of Hotline Miami coming to NZ "soon"